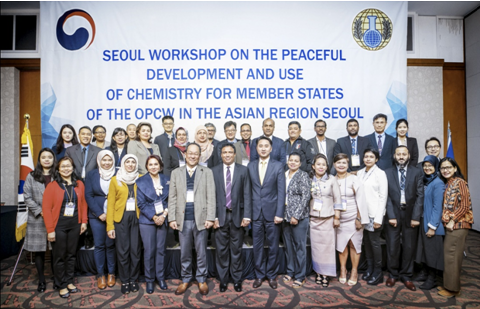 The workshop was organized in order to further promote international cooperation programs that focus on chemical industry outreach and industry related aspects of the implementation of Article XI of the Chemical Weapons Convention. The aim was to enhance communication among stakeholders in the region, focusing on SMALL TO MEDIUM ENTERPRISES (SME) and industry associations such as SPIK among others. By promoting and disseminating standardized and best practices in the chemical safety and security, these enabled the participants to gauge how they are compared to the other countries and thoroughly learn on new ways in implementing the different programs. SPIK was fortunate to send two RC Council members namely Ms. Cynthia Reyes and Mr. Pio Ramirez who joined other local stakeholders like Ms. Cristina Binag of the Chemistry Department of UST and SSUPT Renato Marcial, Director of Plans of the Bureau of Fire Protection. The group was also able to visit the LG CHEMICAL plant in South Korea thru the generous assistance by the Ministry of Foreign Affairs and the Korean Chemical Industry.